3:30 through the evening, leave when you feel like it! It’s a 50’s themed murder mystery party. We’re going to eat and try to solve a murder! The costume suggestions are super cheese, and it’s the last minute, so don’t worry about that! After dinner we’ll be playing games and hanging out. You are invited to a dinner and rock’n’roll party! We’ll be jiving to the top 40 hits of 1959 while the chicken is grillin’ on the barbecue. Storyline: The 50’s — hula hoops, hot rods, black leather jackets. 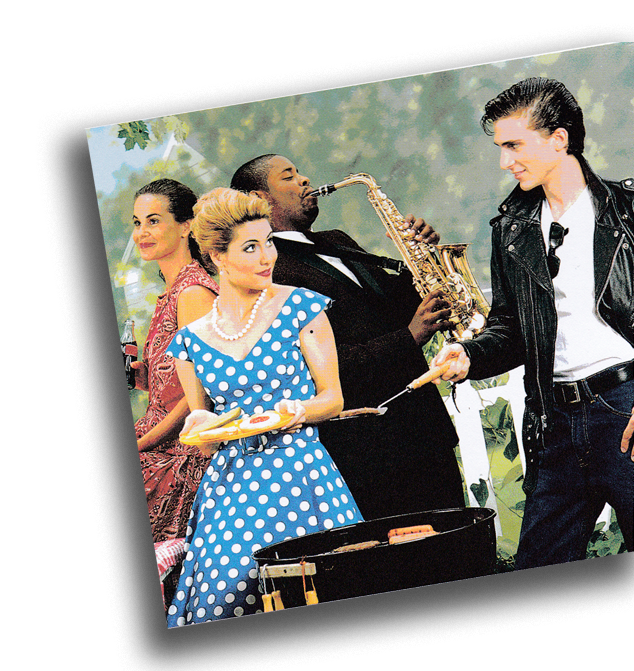 It was the birth of Rock ‘n’ Roll and the backyard cookouts. the setting for this mystery it the suburban home of Tom Dooley in Kansas City, Missouri. Tom, owner of local car dealership ‘Honest Tim’s’ and master of the charcoal grill, has invited his friends and neighbors over for a barbecue and Rock ‘n’ Roll party. A sudden thundershower sends his guests rushing into the house while Tom stays behind to finish cooking the chicken. When the squall ends a short time later, Tom’s guests return outdoors to find his lifeless body lying beside the barbecue and the chicken burning to a crisp. It is a case of cold-blooded murder over a hot grill and you may be a suspect. A mechanic who can fix anything on wheels. When he’s not covered in engine grease, Johnny is cruisin’ chicks in hsi 57 Chevy. Black leather jacket, white t-shirt (with blood-like red spot), tight jeans, slicked hair and dark glasses. Fake switchblade and 57 Chevy optional. Tom’s sweet little sister and the national hula hoop champion of 1958. Dooley would have done anything to keep his sister from getting into trouble… poor little fool. Pony dress, bobby-socks, saddle shoes, ponytail, hula-hoop. A Rock ‘n’ Roll musician who’s finally made is big in the music biz. Chubby’s twisting and shouting in his quest to become a Rock ‘n’ Roll legend… but how low will he go? Flashy sports jacket, white shirt, narrow tie, black pants, black shoes. Limbo bar optional. The dazzling blonde divorcee who’s got it all: an IQ of 140, an itsy bitzy teenie weenie yellow polka dot bikini and heartaches by the number. Tight sweater, pedal pushers, sandals on bare feet. Yellow polka dot bikini optional. A Russian rocket scientist who recently defected to America. He has high hopes of becoming a successful American capitalist. White lab coat, slide rule, eyeglasses, notebook, and collection of rocket propulsion theories. Tom’s pretty fiancee and the newly crowned Miss Kansas City. Tiara is burning with passion to win the state beauty pageant and move on to fame and fortune. And she’s doing it all her way. 50’s style evening gown, tiara, silk sash with the words “Miss Kansas City”, bouquet of roses. A TV actor in a new hit detective series. Tall, dark and handsome, too bad Dan’s got a heart of stone. Just the facts, ma’am! Just the facts. Black suit, black 50’s style man’s hat, dark glasses, fake handgun, pen for signing autographs. A newspaper gossip columnist, dubbed ‘Runaround Sue’ by her press colleagues, there’s no doubt Sue’s a hard-headed woman. Ladies’ hat and dress (50’s style), pearl necklace and high heels.